The 10 Best Doughnut Shops in Kentucky! Everybody loves doughnuts. They are the ultimate sweet treat. Doughnuts are fluffy, sometimes filled, sometimes not, often sprinkled or glazed, but always a welcome sweet any time of the day. 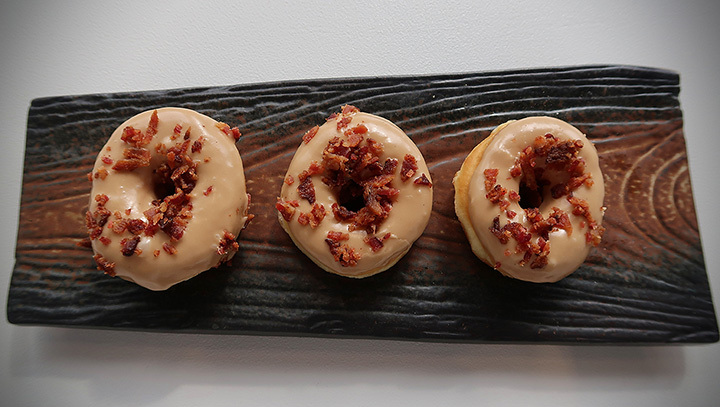 For something creative and delicious, here are the 10 best doughnut shops in Kentucky. When you’re the best and you know it, there’s no need to hide it. North Lime Coffee & Donuts should be tooting their own horn when it comes to having the best doughnuts and the best coffee. How do they do it? By using the best ingredients, making everything by hand, and putting their baristas through intense training. Besides traditional flavors, some of the specialty doughnuts featured include Vanilla Snap, Strawberry Cheesecake, Peanut Butter Honey, Chicken Waffle, and Chocolate Covered Orange. For coffee lovers, you can choose lattes, mochas, Americanos, and specials like espresso favorites Dolce Veloce, Maccihiato, Con Panna, and Cortado, and the iced coffee treat, Shaky Nate. Family-owned and operated since 1955, Red’s Donut Shop in Paducah, Kentucky, is almost a national treasure. With prices that are easy on the wallet and flavors that will tickle your taste buds, there’s no reason not to stop by Red’s. No matter what type of doughnut you prefer, you can find yeast and cake varieties like cream-filled, jelly-filled, fruit-filled, iced, plain, glazed, round, and long doughnut. Considered the best doughnuts in the Louisville area, what could be a better name for a doughnuts shop than Sugar & Spice? In addition to making traditional doughnut favorites, over the years the bakers have been known to create unique flavor combinations like the Chocolate Waffle Cone Donut. These special varieties are popular, but the plain glazed round doughnut is the all-time best seller. Open 24 hours a day, the Great American Donut Shop in Bowling Green, Kentucky, the perfect place to go any time of the day or night when you get that craving for something sweet. With specialties like blueberry cake doughnuts and cream cheese-filled doughnuts, you might think you’re in doughnut heaven when you stop by here. Considered the lifeblood of late-night food and great doughnuts for Western Kentucky University students, this little shop is a gem. If you’re lucky, you’ll get more than just great bakery items when you stop at Hadorn’s Bakery in Bardstown, Kentucky. You might get to hear owner Greg Hadron play some rowdy Cajun music. No trip to Bardstown is complete without stopping by this popular local bakery that’s been around since 1955. And no matter what else you get, you have to try a famous Yum Yum, only one of the best cream-filled pastries of all time. With fresh doughnuts made every day, Pink in a Blanket Doughnuts in Florence, Kentucky, is a great place to start your morning with a yummy treat like a Maple Bacon Long John or an apple fritter. Having the best prices in town helps, too. And if you’re looking for something to wash down those delicious baked goodies, they have fresh fruit smoothies like strawberry banana, pina colada, and wildberry. And if you’re wondering about the name, it’s a play on pigs in a blanket, and yes, they’re appropriate for breakfast or any time of the day, too. You know the saying that the early bird gets the worm? Well, it’s true for getting doughnuts at Frank’s Bakery in Georgetown, Kentucky, too. This small-town bakery offers delicious frosted, filled, sprinkled, and plain doughnuts of all kinds, but you better get there early or you’ll go home disappointed. Frank’s is a great place for a date with your special someone, too, no matter what his or her age might be. Nord’s Bakery in Louisville, Kentucky, takes great pride in everything they make, whether it’s melt-in-your-mouth doughnuts, wedding cakes, or other specialty baked item. This family-owned bakery has been operating since 2002, and they’re now a Louisville favorite. If you want friendly, fast, quality baked items, Nord’s is the place to visit. For some of the best baked goods around and home of the free doughnut holes, stop by Madisonville Donuts in Madisonville, Kentucky. You can find a variety of doughnuts, breakfast burritos, and other baked items. No matter what your age is, you’ll find something you like from this little doughnut shop. If you love the taste of apples, try one of their apple fritters. Winner of the Sweetest Bakery in Kentucky in 2017, Amazin’ Glazin’ Donuts, located in Elizabethtown, Kentucky, has been baking and serving sweet things since 2006. Starting with 10 varieties of doughnuts at that time, they’ve expanded to over 35 different shapes, sized, colors, and types of doughnuts, including other baked items like muffins and cinnamon rolls. With amazing flavors like strawberry cheesecake, chocolate cover cherry, red velvet, and filled powdered doughnuts, the only problem will be deciding which ones to take home. Looking for a great fundraising idea? Talk to the owner about the options for including Amazin’ Glazin’ Donuts in your fundraising activities.